Ensuring 100 percent uptime is a prerequisite for the major colocationfacility, which supports more than 200 customers. 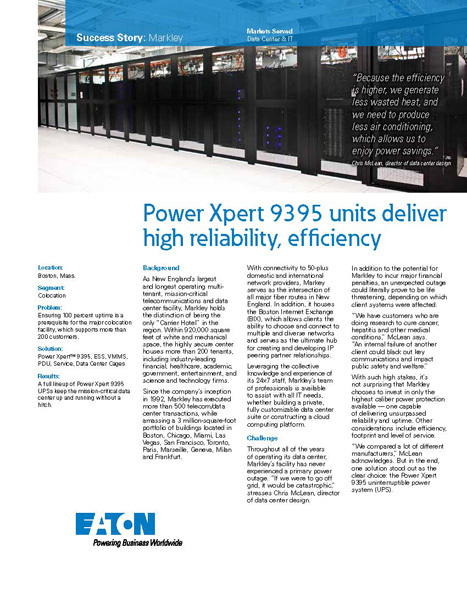 A full lineup of Power Xpert 9395 UPSs keep the mission-critical data center up and running without a hitch. As New England`s largest and longest operating multi-tenant, mission-critical telecommunications and data center facility, Markley will invest in only the highest caliber power protection — one capable of delivering unsurpassed reliability and uptime.